I am not one for guide books. I have never read, nor used a guide book for any of my hikes whether they be a day hike up Scafell Pike with my son or a weeks walk and wild camp over the Pennine Way with a friend or a month long solo pilgrimage on the Camino De Santiago. Over the years I have witnessed many hikers and walkers with a guide book seemingly glued to their hands as they either try to find out where they are ‘supposed’ to go next or what sights they are ‘recommended’ to see. It is these uses of guide books that has kept me from ever reading or using them on my own hikes – I have always been in favour of walking my own walk and seeing my own sights. However, that said I have known about Cicerone Press for many years and, whilst I have never read any of their 300+ guides myself, their guide books have always had a good reputation within the hiking and walking community. So when I was asked to review the Cape Wrath Trail Guide, coinciding as it did with my planned hike of the CWT, I thought it a good opportunity not only to read for myself a reputable guide book, but also one which was very relevant to my own plans for hiking this trail. A follow up review of this book will be written after I have walked the Cape Wrath Trail, but for now I will offer my thoughts on the books contents and structure. Upon opening the book the first thing that strikes me is the Contents list. Here we have, under the Introduction sub-menu, more information than you can shake a stick at. With pages containing information from geology and wildlife you may encounter on the Cape Wrath Trail to planning your trip, from how to be safe and what to do in an emergency to accommodation in the area and how to get there in the first place, the guide book gives quite comprehensive advice before we even step on the trail itself. The preface and introduction give us an insight into what the Cape Wrath Trail holds for any potential intrepid explorer of what is arguably one of Europe’s toughest trails as well as give the reader a taste of the authors style of writing. Here Iain Harper shows he is a great guide writer with his concise and engaging writing and his knowledge of this trail shines through.The guide to the route itself is broken down into 14 main chapters – each covering a specific Stage of the CWT with any alternative routes to a Stage being described in the relevant chapter. There is then an information box giving details on what to expect from the particular Section including any alternative routes, details of any amenities, conditions during different seasons etc. These information boxes are useful as they add more depth to the guide, offering a quick reference to the relevant Stage. 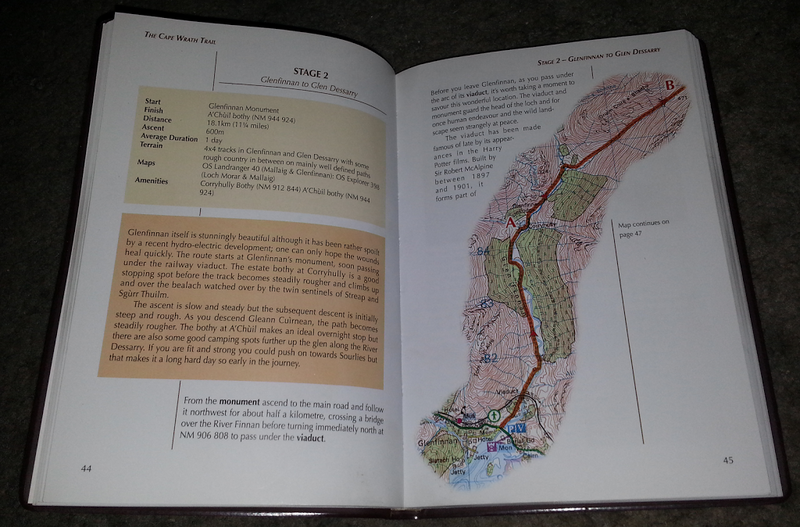 The actual route guide follows with map sections showing the route as well as photographs to help illustrate. The guide itself is very comprehensive and notable features are in bold text with extra information that may be useful contained in the page margins. There are National Grid 6-Digit coordinates for all major start and finish points as well as for any trail turns and notable features. These are very useful, not only to help map reading, but also for entering into a GPS device you may take with you. The author also manages to include non essential information such as historical, geographical and geological features that make the guide book interesting without detracting from the essential information of the route itself. This non essential information is discrete and means a user wouldn’t need the guide glued to his hand yet gives enough of a read when relaxing at camp. These are well worth reading and studying before you set off on the Cape Wrath Trail and the author includes a link to his website, The Cape Wrath Trail, where any updates and amendments to the guide’s appendix can be found. I like the format of The Cape Wrath Trail: Over 200 Challenging Miles Across Scotland. It is well laid out and consistent in its format making it easy to navigate whilst offering ample information in an easy to read yet concise manner. I have no reason to doubt the guides accuracy – Iain Harper has hiked the Cape Wrath Trail many times and in all seasons – and if I was to follow any guide to Scotland’s toughest trail it would be this one. I intend to take this guide book with me when I make my own attempt at the CWT and will update my review of it upon my return. For now I can recommend this guide to anyone with an interest in the Cape Wrath Trail as it will give the reader a good taste of what lies ahead on the trail, written as it is by a respected hiker and author who knows this trail intimately. If all Cicerone guides are of this quality then I can certainly understand their respected reputation. 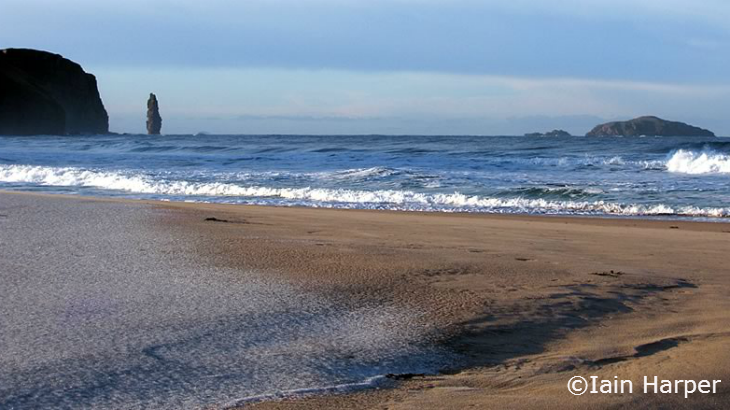 a giant buttress to the wild Atlantic, long after our own time has come and gone. As this is a 1st edition there are a few errors in the book and minor changes to the route itself made since the book’s publication. However, there is a new forum on Iain’s website that has listed corrections and also allows feedback from readers who have noticed errors and/or route changes. I am sure these issues will be addressed in the 2nd edition of The Cape Wrath Trail Guide, but for now I advise readers to review these corrections before using the guide reviewed here. Iain Harper lives and works in the Cotswolds, but has been walking in the Scottish Highlands for over 20 years. 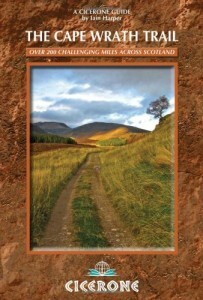 He first discovered the Cape Wrath Trail in 2007 and since then has walked it many times researching this book. *Disclaimer. I was sent a copy of The Cape Wrath Trail: Over 200 Challenging Miles Across Scotland by Iain Harper to review from Cicerone Press free of charge. I am in no way affiliated with either Cicerone Press or Iain Harper and this review is my own and without prejudice. All images are reproduced by kind permission. Book Reviews, Feature backpacking, Cape Wrath, Cape Wrath Trail, Cicerone, CWT, guide book, guides, Hiking, Iain Harpar, LDW, Review, Scotland, walking. permalink.